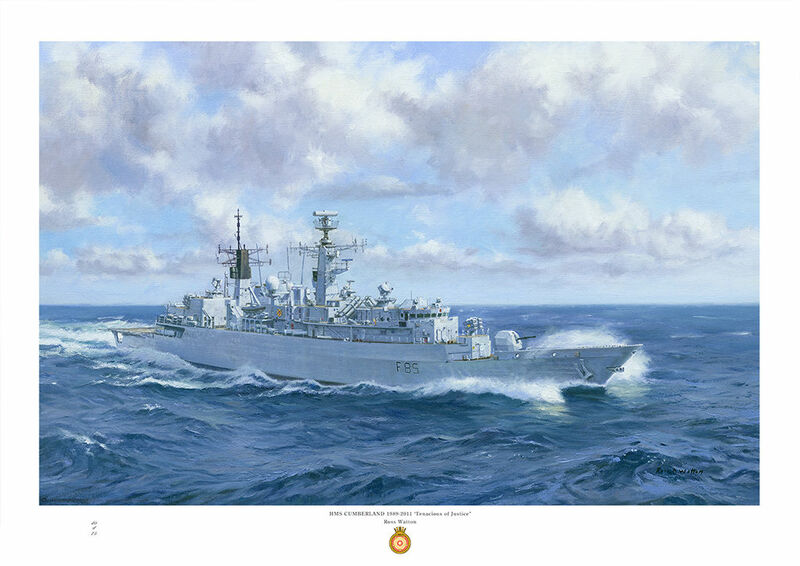 HMS Cumberland (F85) a Batch 3 Type 22 frigate built by Yarrow Shipbuilders Ltd on the Clyde, launched on 21 June 1986 and commissioned 10 June 1989 at Devonport. She is the 16th ship to bear the name in the Royal Navy. During her operational career, Cumberland has seen extensive service in the Gulf of Oman. While en-route home from her final tour of duty, she was dispatched to pick- up stranded British citizens at Benghazi during the 2011 Libyan protests, delivering them to Malta. She has subsequently played a strategic role in a coalition action to protect Libyan nationals. Her length is 486 ft 9in, with a standard displacement of 5.300 tons and top speed of 30 knots. HMS Cumberland was decommissioned on the 23 June 2011. Original painting is sold.